Lindsey Johnson Snider was raised LDS and attended BYU-Idaho from 2012-2016. She experienced a shift towards progressive/liberal Mormonism in 2013, which coincided with a faith crisis. Later, Lindsey became the editor in chief of the BYU-Idaho student newspaper called “The Scroll,” and worked for the paper until the end of 2015. During her time with “The Scroll” Lindsey wrote many controversial editorial and opinion columns, which both changed some hearts and minds on progressive issues, and also upset/angered some orthodox Mormons. 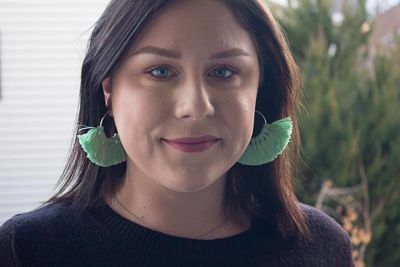 Lindsey’s tenure with the paper included a meeting with the dean of the BYU-Idaho religion department, wherein all BYU-Idaho religion professors were told to be more respectful of those in their classrooms who may be part of the LGBTQ community. Today we will be discussing Lindsey’s story, going into depth on the good/bad/ugly of attending BYU-Idaho, along with Lindsey’s faith journey and her experiences with grief. I don’t remember every secular class starting with a prayer when I was at “Ricks.” Is this a recent change? When I was at BYU-Idaho it was about 50-50. It really depended on the professor if we had a prayer or not. Some of my professors (mostly in my religion classes) even had us start with a hymn along with the prayer. I was impressed with Lindsey (at approx. 1.50) setting out the issue of consent, which I’ve rarely, if ever, heard identified so clearly. Could you specify minute mark of which of the download of that which you are talking about? This specifically caught my attention as in other interviews men mention not taking no for an answer and believing it was okay to continue trying until they got what they wanted, one even acknowledging his behavior as stalking in a joking manner. Hi, John Dehlin says in the part 1 he’ll put up a link to the Bell Hooks pdf, and in part 2 he says he’ll put up a link to personal blog post about why she walked out of her religion class. I would also love to read the blog post titled something like Why I Walked Out of My Religion Class Today. Link please? I found the post on archive on the wayback machine.